Hospital management system database design is uploaded in this page. A database is a collection of information and is systematically stored in tables in the form of rows and columns. The table in the database has unique name that identifies its contents. The database in turn is further described in detail giving all the fields used with the data types, constraints available, primary key and foreign key. Database design is used to manage large bodies of information. In this database we describe all the 4 tables available in the software, which are used to store all the records. Fields in database table have a data type. Some of the data types used in database table are explained below. One optional sign character (+ or -) followed by atleast one digit (0-9). Leading and trailing blanks are ignored. No other character is allowed. It is used to store alpha numeric characters. In this data type we can set the maximum number of characters upto 8000 ranges by default SQL server will set the size to 50 characters large. Date/Time data type is used for representing data or time. 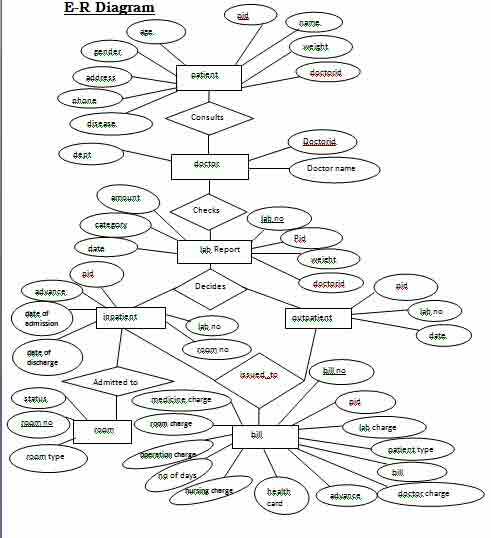 Entity relationship diagram is used in modern database software engineering to illustrate logical structure of database. It is a relational schema database modeling method used to model a system and approach. This approach commonly used in database design. The diagram created using this method is called E-R diagram.